I am so happy to be able to say that! This marks the first day of my favorite time of the year. It’s when I am always at my happiest and the weather at my most favorite. Before long we’ll see the leaves turning and the air will be crisp and there will be soup and bread and cookies going non – stop in my kitchen. It also means Halloween is around the corner – and we looooove Halloween here. If I can get my act together and get organized enough I may try and throw a Halloween party. There are lots of projects going on here right now as I make my final push before home school starts next Tuesday (any my birthday on Wednesday, woohoo!). There are dresses and shirts and sweaters started for all the girls. I am actually even running out of fabric! Imagine that!!!! I’ll need to start buying more! 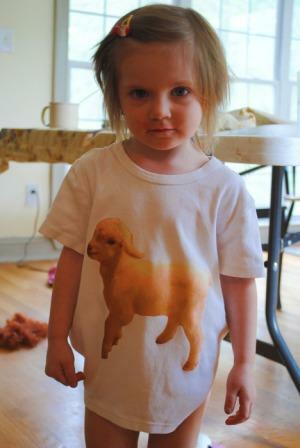 I made each of the girls a shirt with one of our animals on it. Oona got Finnigan as a newborn. Neve got one with Jasper cat and Emily’s has Big Jim the rooster. 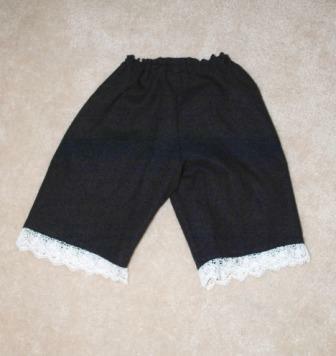 Each girl also got a pair of these baggy black linen capris with lace trim, from the book Carefree Clothes for Girls by Junko Okawa. 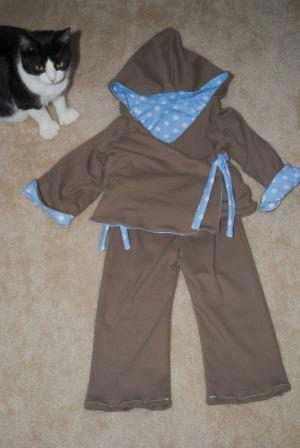 I also finished another yoga suit for Oona. I am really thinking I am going to work out a way to make this pattern for adults as well, since it looks so incredibly comfortable and flattering! Unfortunately it has been way too hot to do much work outside. We’ve gotten some good swim time in since there’s been no rain, but I am hoping to get some yardwork done before too long. My raised garden beds need some weeding. The good news is my acorn squash is doing well…….AND the arugula I planted in the spring has re-sprouted and is growing in again! Hooray for September! This entry was posted in Kids and tagged food, Garden, Sewing. Bookmark the permalink.